It's funny how this happens. One day you're comfortably driving your normal route and the next day it takes you twice as long to get anywhere. They seem to arrive like a plague of locusts--at least traffic wise; it's anything but gradual! As if, when the snow starts falling up north, aircraft line up like school buses before the bell rings, all pointing toward Florida. TOURISTS! Can't live with them, can't live without them. However, once we're over the shock, we manage to adjust, again, to their annual pilgrimage. Besides, we realize they'll mostly hang out at the beach. Floridians don't go to the beach in winter (more commonly defined by the rest of the world as January) unless we work there. The northern tourists, however, in pursuit of a prized tan to show off to their friends back home, do--which I'm still rather perplexed about. Once they go back, won't they be wearing sweaters, leggings, boots, scarves, and hats? Is it a face tan they're showing off? Also, Floridians don't swim once the temperature drops below 72 degrees. If you think we do, you must have us mixed up with Californians. It's ok. 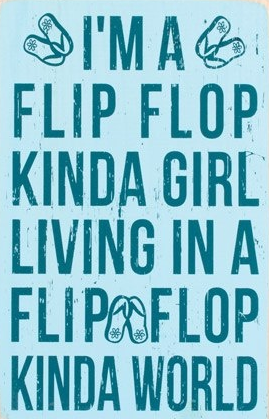 The tans and flip flops confuse people. There is one other exception, and it's when our northern relatives drag us there (thanks Aunt Clara for the childhood memories huddled under a beach towel, FREEZING!). Ok! That was fun! OMG - I'm right there with you!